MERRY CHRISTMAS!!!! I have received many Christmas wishes through emails and cards. Thank you guys so much. I felt so loved and blessed knowing I haven't been forgotten being out here for a while. I am so excited to Skype with my family in 2 days!!! Have to make sure I won't feel homesick after that. Haha. This year Christmas definitely has a deeper and special meaning to me serving as a representation of Christ. So, it has been another week full of works and activities.We have mission Christmas activity on Thursday where all the missionaries gather together have pictures, food, fireside. I just love the reflections time from missionaries who are about to go home. So inspiring, and once again grateful that I'm not the one up there yet. We were also helping the ward with Christmas night last night which is fun. I love helping ward with Christmas activities and through them, we get to know the ward members better and help their non-member friends/family they brought to these activities felt welcoming at the church. This week I won't write as much but will let pictures to let you all what has been going on apart from regular missionary work. I love you all and have a wonderful Christmas. May your Christmas fill with the Spirit of Christ. We went to a tourist place called Wen Wu temple to take our mission picture.Take half an hour to get all the missionaries to stand still and take 3 snaps. It was also very spiritual and powerful as 220 missionaries sing our mission song and a Christmas song together in front of many tourists after the picture taking. Me and Sister Hsu waiting to go to next destination - Sun Moon Lake, another famous tourist place. 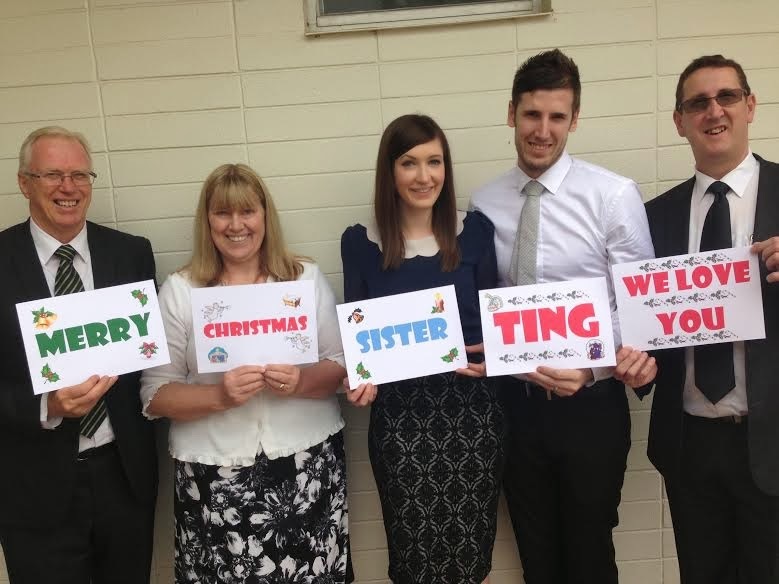 Beloved friends from Australia sent their Christmas greetings!